Foliage: Large leaves turn red in fall. Water: Somewhat drought resistant once established but prefers a moist site. Soil : Adaptable to many soil types. Salt tolerant. Sun: Full to partial shade. Comments: Long lived. Good shade tree. Known for its long lasting fall color. 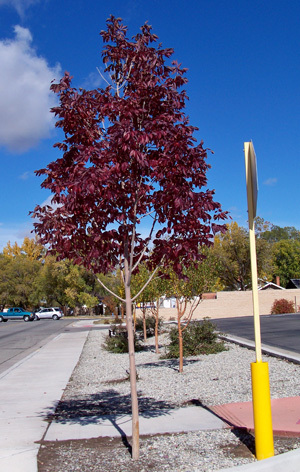 'Autumn Purple' is a male tree introduced in 1956. Recommended for buffer strips around parking lots. Does not have seeds. Easiest to identify in the fall when foliage turns purple. Warnings: Surface roots can lift sidewalks or interfere with mowing. Street Tree? yes Street Tree Conditions: As long as there is plenty of soil space. Known Locations: Walgreens at corner of Main and LaVeta.